(Reuters) - International Business Machines Corp reported its worst quarterly revenue in 14 years as results from newer businesses including cloud and mobile computing failed to offset declines in its traditional businesses, sending shares down nearly 5 percent in extended trading. Revenue of the world's largest technology services company fell 4.6 percent to $18.68 billion in the first quarter, but beat analysts' average estimate of $18.29 billion. It was the 16th straight quarter of revenue decline for IBM. Under Chief Executive Ginni Rometty, IBM has been moving toward areas such as cloud-based services, security software and data analytics, while trimming its traditional hardware business by exiting low-margin businesses. However, revenue in the company's newer businesses is failing to make up for declines in its traditional segments. 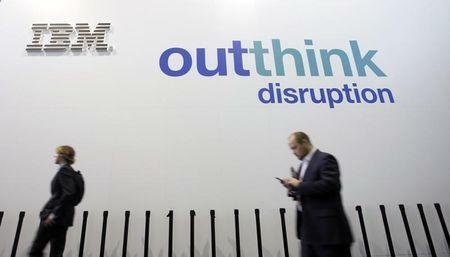 Bernstein analyst Toni Sacconaghi, in a research note before results, wrote that the falloff in IBM's traditional businesses was dwarfing the company's ability to capture new revenue. Revenue from "strategic imperatives," which includes cloud and mobile computing, data analytics, social and security software, rose about 14 percent in the first quarter. But revenue from the services and hardware segments fell 4.3 percent and 21.8 percent, respectively, in the quarter. Excluding items, IBM earned $2.35 per share, beating the average analyst estimate of $2.09. The company received a $1 billion refund in the quarter that lowered its effective tax rate to a negative 95.1 percent compared with 19.5 percent last year. The company maintained its full-year adjusted earnings guidance of at least $13.50 per share. Analysts on average were expecting $13.55, according to Thomson Reuters I/B/E/S. Up to Monday's close, IBM's shares had risen 10.83 percent this year, compared with a 2.46 percent gain in the S&P 500 index <.SPX>.